(NaturalNews) Most people have experienced a mild case of hypothermia at some point in their lives. However, the condition can become lethal very quickly, so it's important to be able to recognize the warning signs and know what to do before the situation becomes critical. 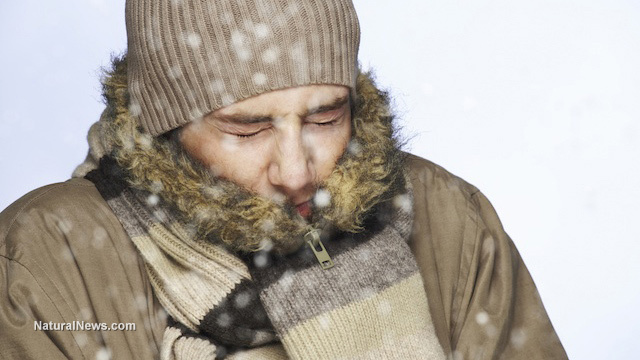 Hypothermia occurs when a person's body loses heat at a rate faster than it can produce it, causing the core body temperature to drop to dangerous levels. When body temperature drops from the normal 98.6°F to below 95°F, hypothermia has begun to set in. At low temperatures, the body cannot function properly. If hypothermia goes untreated, the body's organs begin to fail, and eventually the heart and respiratory system stop working, leading to death. The symptoms of mild hypothermia include shivering, fatigue, increased heart rate, poor coordination and confusion. Other symptoms may also appear, such as dizziness, nausea, speech impairment and fast breathing. As the condition worsens, the symptoms become more pronounced. The slight confusion experienced with mild hypothermia becomes more severe, sometimes leading to irrational behavior (such as removing clothing) or a state of apathy regarding one's situation. The victim may become drowsy and display a weak pulse. Eventually, the shivering stops and breathing slows down. When this point is reached, the situation becomes critical, because the person may not be able to recognize the danger that they are in. That's why it's important to recognize the warning signs of mild hypothermia and respond immediately and appropriately, before the condition leads a victim into a dangerous mental and physical state. It's also crucial to understand what type of conditions trigger hypothermia so that they can be avoided in the first place or at least corrected quickly when they occur. The loss of body heat can occur when body parts are unprotected from the cold, causing body heat to radiate or dissipate into the environment. Heat can be conducted away from the body when it comes in contact with water, cold surfaces or cold air. Preventing hypothermia is more preferable than having to deal with it at all, and some of the causes may not be so obvious. One of the most common mistakes that leads to hypothermia is dehydration because people mistakenly believe that they don't need as much water in a cold environment. I've seen more than a few "tough guys" succumb to the cold because of this. Adequate hydration allows your body to properly convert food into energy, which creates body heat. It also allows your blood to flow more freely and transfer heat throughout you[r] body. Even though it's necessary to stay hydrated on the inside, keeping the outside of the body dry is just as vital. Water conducts heat more efficiently than air, so it poses one of the greatest threats to those exposed to cold conditions. Becoming wet while in freezing temperatures is one of the easiest ways to contract hypothermia. Stepping into water accidentally or breaking through ice are two of the obvious ways in which a body might become wet, but even sweating can lead to hypothermia in the right conditions, especially if a person is wearing the wrong type of clothing. Build a fire -- A fire can restore the body's temperature very quickly, but caution must be exercised. If body parts are numb from the cold, it can be easy to burn the skin without realizing it. Get dry -- Remove wet clothing and dry the skin, without exposing body parts to cold air, if at all possible. Always carry a pair of dry socks and a change of clothing when venturing into the cold. Engage in vigorous physical activity -- Strenuous physical activity can ward off hypothermia, but keep in mind that exercise burns fuel that the body needs to stay warm. This is only a good strategy to use for a short period of time.